Riot Games has lifted the lid of a hefty update coming to Summoner's Rift , describing it as "a big part of our commitment to continually improve League of Legends." There's still work to be done but the update should be ready to roll out to the public beta environment in the relatively near future. Riot said that while the "fundamental structure" of the map will remain unchanged—flashable walls, turret ranges, lane sizes, brush interaction and ward placements will continue to work as they currently do—the plan is to improve gameplay by providing "additional clarity." A combination of map design and buffs in each quadrant provide "thoughtfully placed landmarks and subtle color cues," helping players maintain their orientation, while new monsters have been added with designs that will accurately reflect their in-game characteristics. New models for Baron Nashor and Dragon are more expressive, and we spotted a new toad-like monster with tusks called Gromp lurking in the jungle. There's also been a focus on eliminating the randomness of Baron's and Dragon's attack patterns so players can more easily predict and avoid them. "What clarity translates to is the updated map doing a better job of drawing eyes to the most important information of the moment," the studio wrote in a new post. 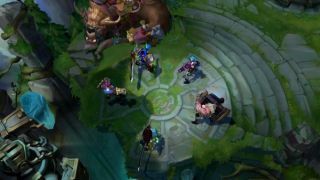 "When fights break out, the environment should be the background, allowing particle effects and champions to pop off the screen and feed players the crucial data they need to make the right play." A hard launch date hasn't been settled, but Riot said the update will be rolled out to PBE soon. A live beta is being considered, but technical considerations make it a "tricky proposition" this time around. As for how it will impact other maps, Riot admitted that it's really not sure how that will work out, saying, "We're laser-focused on getting this update to players globally."